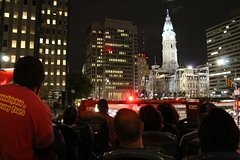 Discover the best of the City of Brotherly Love after dark on this 90-minute bus tour. In a double-decker bus that’s open to the stars, you’ll cover more than 16 miles of Philadelphia’s downtown, swinging by all the quintessential sights as you go. From the Philadelphia Art Museum (and its steps, made famous by Rocky) to the historic Independence Hall, you’ll see just what makes this city special. Your guide will provide live commentary and fascinating historic tidbits to accompany the sightseeing. Enjoy the perfect overview of Philadelphia — and see its sights illuminated at night — on this after-dark bus tour. Boarding begins outside the Philadelphia Marriott Downtown at 7:30pm, and you’ll be whisked away by 8pm. On this 90-minute ride, sit on the open upper-deck for the very best views, and cover 16 miles across the City of Brotherly Love. The tour begins on Market Street, where you'll find the city’s indoor, foodie-favorite Reading Terminal Market. From there, you’ll drive past LOVE Park (home to the iconic Robert Indiana LOVE statue) and Logan Square before heading to Philadelphia’s best-known museums. See the Eastern State Penitentiary, glimpse the Philadelphia Art Museum and its famous steps, and zip past the Rodin Museum, the Barnes Foundation, and the Franklin Institute. From there, you’ll make your way to Rittenhouse Square, one of the city’s most affluent areas and prettiest public parks. Then, drive past the Kimmel Center for the Performing Arts, Antique Row, and to the bohemian enclave of South Street, which you’ll follow all the way to the Penn’s Landing waterfront. The final stretch of the tour will take you to Old City, where you’ll uncover Philadelphia’s colonial history in the form of Independence Hall, the Liberty Bell, and the Constitution Center. After that, you’ll drive past Chinatown and its famous red arch before returning to your original point of departure. Throughout the 90-minute tour, your guide will provide historical context and tell many fascinating stories about the city’s past.